Another weekend, another world record attempt. Around 11:30am on Sunday morning, the Ipswich Corn Exchange was the place to be. 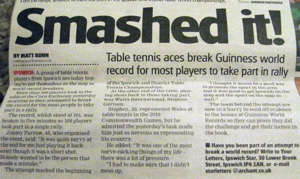 As a bonus event for the IDTTL 2012 Championships, ping-pong players from across the county had been summoned to be among "the most participants in a table tennis rally". We grabbed our bats, glanced through the complicated instruction sheet, and took our places. A beginner's stroke: what could be simpler? Except that nobody wanted to be the one to miss. Imagine the embarrassment. Into our separate areas we went for an initial count. That record stood at 100 players. We'd need at least 101 to make it viable. Current tally: 99. Can't do it. At which point a call went out around the hall, and certain individuals who'd been hoping not to take part were smoked out. I haven't got a bat, protested one. We'll find you one, came the answer. Now up to 108 rather nervous batsmen, batswomen and batschildren. We were broadly lined up in order of ability, from least experienced up to nationally ranked players. That meant a bunch of juniors would be going first in our conga line. Adjudicators in place, camera rolling, off we went. attempt 1: all going well until about the 8th shot when a small boy knocked it into the net. No problem. We'll go again with that poor lad at the start of the queue. attempt 2: proceeding smoothly when a young girl put the ball off the table. Another groan, everyone thinking "there but for the grace...". attempt 3: safely past the kids and into the realms of the older players, including yours truly. Up next, knock, back safely, move quickly out of the way and watch the other poor suckers lining up. Several extremely tense minutes later, up stepped Ryan Collins to play the final shot, and we'd done it! Much applause and mutual congratulations. Now waiting for the attempt to be ratified but, bats crossed, we could be in the next Guinness Book of Records. Well done to Jimmy Farrow, as ever, for organising not just this one-off event but the whole weekend, including an excellent finals night: nice one!